Table lamps were any companies 'stock' lines, and this was the same for Edward Miller. Table lamps were churned out in all manner of sizes and design to suit the very rich and the working classes. They were produced to meet the market in a broad range of uses. Table lamps were needed everywhere - but you would not want to take an expensive, heavily embossed nickel table lamp to the workshop, or into the kitchen. 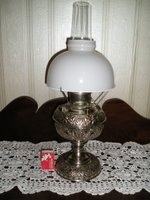 Similarly, you would not take a plain lamp into the sitting room, if you were fortunate enough to have one. Likewise table lamps came is many sizes, and with the size dictating its use, light output and economy. These lamps were designed for stability, light output and ease of movement. Table lamps exist with each of the miller patented designs, each patent was produced in four main font sizes ('Tiny', No. 0, No. 1 and No. 2) and each size was produced in plain and various levels of embossing (except for the 'tiny' which is not known in plain brass but embossed only). The 'Tiny' and No. 0 lamps shared the No.0 sized burner, with the No. 1 and No. 2 each have their own respective burner size. Each size is was also produced in brass or nickel plated. 'Cup' lamps, lamps with two decorative handles fitted (one to each side of the lamp) are just a further decorative version of the table lamp and were not in themselves designed to be 'carried' (like hand lamps were). A 'tall' table lamp also exists, it is essentially the same as the No. 2 table lamp but with a slightly longer stem, giving the lamp a little extra height. # lamp identified has evidence that it may have been originally nickel, but stripped to brass in more recent times. * Although the lamp seen is embossed 'The Tiny Miller' it is fitted with a 'Juno' wick raiser - not the 1892 patent 'Miller' raiser. 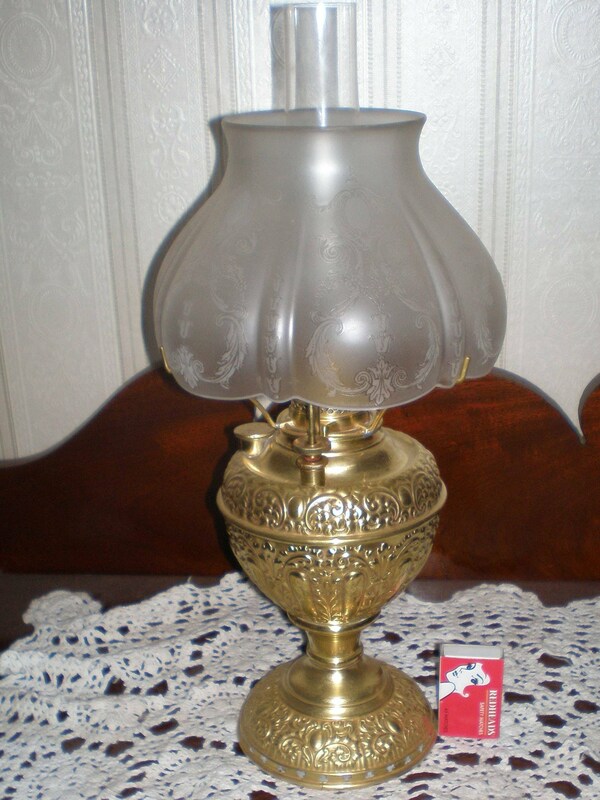 Below are links to photographs and detailed descriptions of the various table lamps. Essentially the same as the Miller ‘No. 2 lamp displayed adjacent, this lamp was slightly smaller, with a smaller No. 1 sized burner and font with less capacity. This lamp gives less light but was much more economical to use. It was never a popular size and is thus scarce today. Cheaper to purchase than its larger cousin its size and smaller 7” dome shade made it easier to move around. The font capacity is 1 quart (2 pints – 950ml) and is rated to 35 candle power with a burning time of 9 hours. 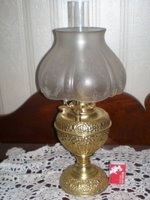 A lamp for a smaller room, often used in bedrooms on a chest of drawer, bathrooms, or halls and kitchens where economy was needed but low light could be tolerated. Hieght (to top of burner) 10 1/8" Circumfrence of fount 17"
Again this lamp is simply a ‘smaller cousin’ to the Miller No. 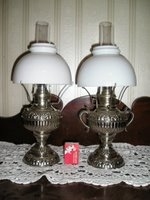 2 Table lamp. Much smaller in size it was not a ‘general use’ lamp. Its smaller size and small 6” diametre dome shade enabled it to be placed in areas of limited space. A nice stable lamp small in size gave it increased economy to use although it gives off only limited light (25 candlepower) with it’s No. 0 burner and due to it’s scale, is somewhat ‘fiddly’ to light. It has a small font capacity of 1 ½ pints (710ml) which lent it to being used occasionally for short periods of time. This lamp was for the dressing table, or perhaps a child’s bedroom. Perhaps a plainer cheaper version (no embossing etc) might have been found in the cellar or pantry. Photographed here with its original fixed 6" tripod and dome shade. Although this lamp has the same shape and proportions at the Miller No. 2 the patterns in the embossing are different. Hieght (to top of burner) 9" Circumfrence of fount (at under lip) 14 1/2"
This lamp, displayed with an unusual and early 6" etched dome shade is an unusual and scarce form of the No. 0 lamp in that the fount is elongated, and shaped somewhat like that of an acorn. As a result the fount has a slightly larger capacity and can accomodate a larger wick. Height (to top of burner)9 3/4" Circumfrence of fount (at under lip) 14 1/2"
The smallest of all Miller central draught lamps, this dainty little lamp was only of very limited use. This lamp is nearly always found as a 'Juno' and inscribed 'The Tiny Juno Made in the USA' however other examples are known. For example one with the Juno style wick rasier is known inscribed 'The Tiny Miller' and it would appear likely (although not seen) that the lamp was made with the c. 1892 patent wick raiser as the same fount with the c.1892 raiser is known as a hand lamp. Although used as a night light, this lamp is not designed to be carried. Its small size makes it somewhat unstable, particularly with a shade, even though it itself is only 6” in diametre. Fitted with the small No. 0 burner it gives off little light, but is extremely economical to burn. The small font only holds ¾ of a pint (350ml) of kerosene and when lit will burn for only 4 hours at 25 candlepower. A lamp for the bedside table, a child’s night light or perhaps for a child’s dressing table. 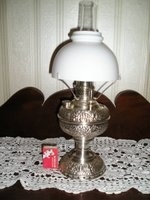 With it is a matching 'Tiny Juno' cup lamp - an extremely scarce lamp. Hieght (to top of burner) 8" Circumfrence of fount 12 1/2"